01:55 — Sarah Jane Adventures: Matt Smith (11th Doctor) and Katy Manning (Jo Grant). 03:39 — Torchwood: Fox turns down Torchwood USA. 05:53 — Doctor Who: Graham Norton gatecrashes The Time of the Angels. 08:45 — Doctor Who: Cybermen infultrate the Lib Dems. 10:44 — More Politics: Patrick Stewart backing Labour party in Crawley! 12:32 – Doctor Who: The Victory of the Daleks. 29:32 – Ashes to Ashes: Season 3, episode 3. 58:04 – Farewell for this podcast! 58:52 — End theme, disclaimer, copyright, etc. BBC: Doctor Who – The Victory of the Daleks. Adam J Purcell, Andy Simpkins and Keith Dunn sit down in front of Doctor Who: The Beast Below and spout our usual nonsense. BBC: Doctor Who – The Beast Below. 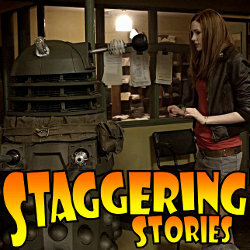 Staggering Stories Podcast #70: Oh, You Beast! 01:32 — Doctor Who: Matt Smith on magazine front cover. 04:18 – Doctor Who: The Beast Below. 22:12 – Escape Pod Discs: Graeme “The2ndDoctor” Sheridan. 28:50 – Ashes to Ashes: Season 3, episode 2. 59:19 – Farewell for this podcast! Professor How, Doctor Who Parody Podcast. 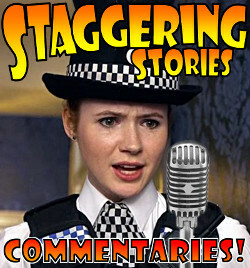 Welcome to this first Staggering Stories audio commentary! This time Adam J Purcell, Andy Simpkins, Fake Keith and the Real Keith Dunn sit down in front of Doctor Who: The Eleventh Hour and spout our usual nonsense. Apologies for the rather less than great audio quality, that is something we will try to address in future commentaries (assuming people want to hear more). Also please bear with us as we get used to this whole commentary business – The Eleventh Hour is particularly easy to get caught up in! BBC: Doctor Who – The Eleventh Hour. 02:42 — Doctor Who: The Adventure Games. 05:44 — Doctor Who: The Daily Mail STILL hates Amy Pond. 08:12 — Primeval: DS9’s Julian Bashier to join cast. 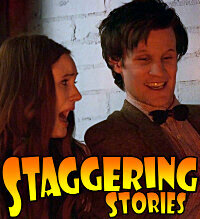 10:24 — Doctor Who: Jean sees Matt Smith and Karen Gillan in the flesh. 13:37 – Doctor Who: The Eleventh Hour. 34:27 – Ashes to Ashes: Season 3, episode 1. 85:30 – Farewell for this podcast! 85:56 — End theme, disclaimer, copyright, etc. BBC: Doctor Who News – The Adventure Games.